Dr Schüssel served as a member of the Austrian Parliament (1975–1989). He worked as Minister for Economic Affairs (1989–1995) and he was Vice Chancellor and Federal Minister for Foreign Affairs (1995–1999). Dr Schüssel played a key role in Austria’s EU Presidency of the Council of General and Foreign Affairs (July–December 1998). He also worked as National Chairman of the Austrian People’s Party (1995–2007). Serving as Federal Chancellor of Austria, amongst other things, he strove for the integration of Austria into the European Union. 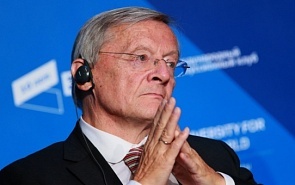 Austria held the EU Presidency (January– June 2006) and Dr Schüssel was Chairman of the Austrian People’s Party parliamentary group (2006-2008). Since 2007 Dr Schüssel has been a member of the Board of Trustees of the Bertelsmann Foundation and since 2010 he has been a member of the supervisory board of RWE AG. Since 2008 he has been President of the Foreign Policy and United Nations Association of Austria. Together with Ambassador Martin Vukovich he established the Think Tank “DER-Dialog-Europe-Russia” (2011). ﻿There can’t be any doubt that the refugee crisis of 2015/16, Brexit, and the emergence of fundamental differences between the old EU countries and some of the new ones in the East about the concept of integration versus national sovereignty are major challenges for the European Union. Wolfgang Schüssel, Austrian Chancellor in 2000-2007, explains why there is a growing opposition to globalisation and universalism in today’s world and how we handle it. The dramatic battle over Aleppo and the beginning offensive against the so-called Islamic State in Mosul will generate further refugee flows. It is tragic that the regional and global actors have not yet succeeded in finding a peaceful solution. The root cause of these alarming developments is the erosion of global order and the massive arms build-up by the major powers. The long-term consequences are going to be disastrous – the brain drain, ethnic and cultural conflicts, the failure to achieve sustainable integration. After the events of Paris and the Sinai Peninsula the fight against international terrorism must be intensified and carried on by a wide coalition of states. America is in a specific position because it's still the strongest military power on the global scene. But it is not the only leader, and we are entering a phase where we have kind of a multipolar world, where there are regions, like America, South America, Europe, Russia, Asia.